Your request is welcome! Let us know what you are going to do, we'll gladly assist. 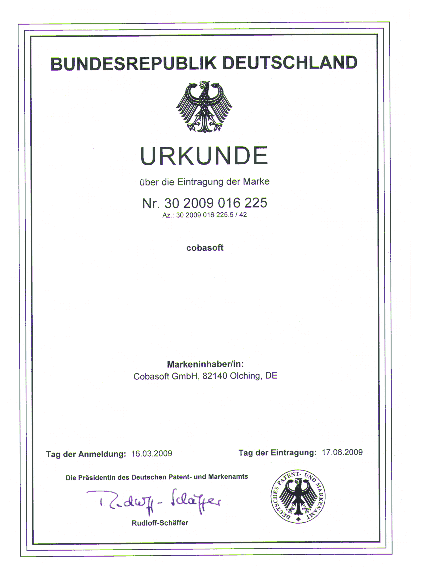 The company is registered in the Trade Register Marburg: "HRB Marburg 7195". It was founded 1996 in Braunschweig. The managing director is: Karl-W. Geitz. "cobasoft" is a registered trademark of Cobasoft GmbH. This website is NOT using cookies. It is intentionally NOT using any kind of tracking mechanism; there is no correlation with other websites visited. For technical reasons, every internet browser automatically sends some information to the websites it visits. These includes, among others, date and time of access, the referer URL, the names of the accessed pages, browser type and version, operating system and the client IP address. These data are NOT correlated with user data or personalized in any way. They might be used for web usage statistics. This website is NOT storing any personal information, with the exception of messages you directly and intentionally sent to us. No personal information is passed to third parties without your explicit consent. The author takes no responsibility for the currency, accuracy, completeness or quality of the information provided. Liability claims against the author which refer to damages of material or immaterial nature caused by use or non-use of the information presented or by the use of erroneous and incomplete information are exempted, unless the author is deemed to be demonstrably, intentionally or grossly negligent. All offers are non-binding and without obligation. The author expressly reserves the right to alter pages of the offerings or the entire offering without notification or to supplement, delete or alter the publication temporarily or permanently. For direct or indirect references to external websites ("hyperlinks") which lie outside the responsibility of the author, liability would only be enforceable where the author of the content is aware of any infringement and if it would have been technically possible and reasonable to prevent the use of illegal content. The author hereby expressly declares that at the time of external linking, no illegal content has been observed on the linked pages. The author has no influence over the current and future design, contents or authorship of the linked pages. The author, therefore, dissociates themselves hereby expressly from all contents of all linked or connected pages which have been altered after the link was established. This statement applies to all information within one's own Internet offering, links and references as well as for external entries in guest books, discussion forums, link directories, mailing lists and all other forms of database to which external write access is possible to the content. Liability for illegal, incorrect or incomplete contents and especially for damages resulting from the use or non-use of such information rests solely with the provider of the page to which the link was made, not with the entity who has linked to these pages. The author endeavours to consider the copyrights of graphics, sound documents, video sequences and texts used, either to use his own graphics, sound documents, video sequences and texts or to use licence-free graphics, sound documents, video sequences and texts. All brand names and trademarks mentioned and possibly protected by third parties within the Internet offering according to the provisions of applicable trademark law according and in turn to the ownership rights of the respective registered owners. Upon the mere mentioning of a name the conclusion cannot be drawn that trademarks are not already protected by third party rights at that stage! The copyright for publication of any material created by the original author remains solely with that author. Duplication or use of such graphics, sound documents, video sequences and texts in other electronic or printed publications is not permitted without the express permission of the author. If the opportunity to enter personal or business data (email addresses, name, addresses) within the Internet offering is provided, the input of such data by the user is on an expressly voluntary basis only. The exploitation and payment for all services offered is permitted - if technically possible and reasonable - without specification of any personal data or under specification of anonymous data or alias. The use of contact data published in the context of the imprint or comparable details like postal addresses, telephone or fax numbers and email addresses for sending unsolicited information is prohibited. Legal action against senders of spam mail in violation of this prohibition is expressly reserved. This disclaimer is to be regarded as part of the internet publication to which you were referred on this page. If sections or individual formulations of this text do not, do not completely or no longer correspond to the legal position, the remaining parts of the document remain unaffected in their content and validity.